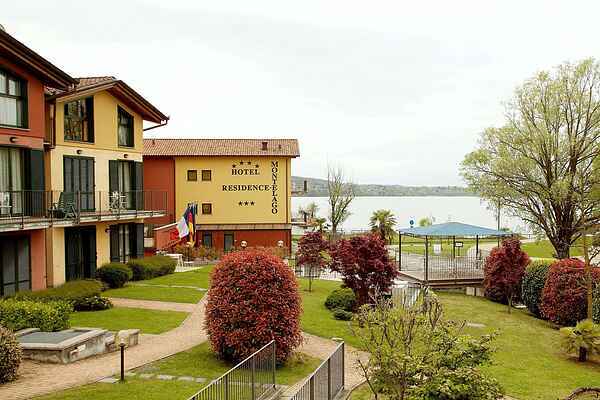 Apartment in a modern and elegant residence, situated at the center of a hilly area rich in lakes: it is located 50 meters from the shores of Lake Comabbio, and a short distance from the lakes of Monate and Varese. The Lake Maggiore is just 10 km. The residence is therefore an ideal starting point for excursions to places of interest nearby. There are countless bicycle routes in quiet places, starting from the bike path, 12 km long, starting just 50 meters from the residence, which allows to travel the entire perimeter of lake Comabbio. Free parking space. The train station, with direct connection to Milan, is 5 minutes walking distance. At the adjacent Hotel Montelago there is a great restaurant and you can also find a bicycle rental service. There is also the "salt room " whose walls are made of crystals of salt of Himalaya, with beneficial properties, ideal to find wellness and relaxation. Between the blue of the lakes and the green of nature, a world to be discovered! The lake of Comabbio is surrounded by a 12.5 km length bicycle lane. It is one of the most striking and panoramic of the province of the Lakes, thanks to its beautiful natural views and its wooden footbridge that will allow you to ride (or walk) suspended on the water for 500 meters! The track is also connected to the Varese lake cycle path, a real natural oasis, surrounded by small medieval villages, rich in history and full of charm: the ancient monastery of Voltorre, the stone ice houses, the picturesque fishermen's houses give the pleasure of a place where time seems to have stopped... a place where nature is the undisputed queen of everything. It is also worth to visit the Isolino Virginia, cradle of civilization, declared Unesco heritage thanks to the numerous findings of prehistoric epic. The bike path is from the Hotel 0 Km - Hotel Montelago offers its guests a bike rental service.